The process is simple. Parishes send us their list of parishioner contacts (email and address). 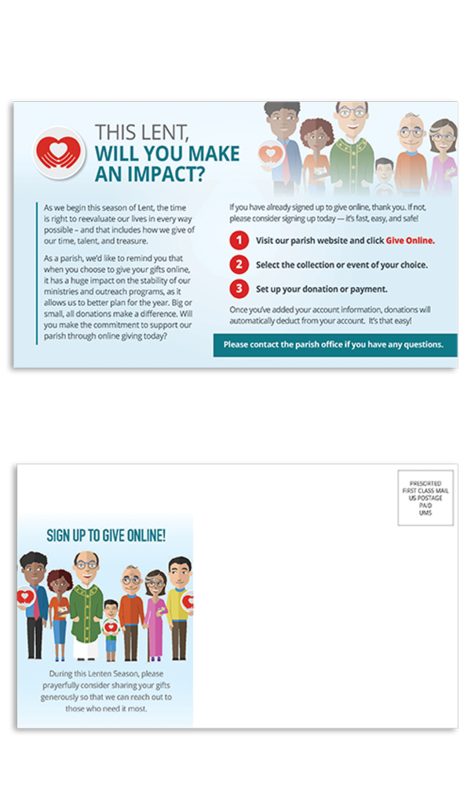 Then four times per year, a customized email is delivered to their members, along with a post card sent twice a year, reminding them of the ease and benefits of online giving, and how to sign up to donate. Best of all, the campaign is free for all WeShare customers. 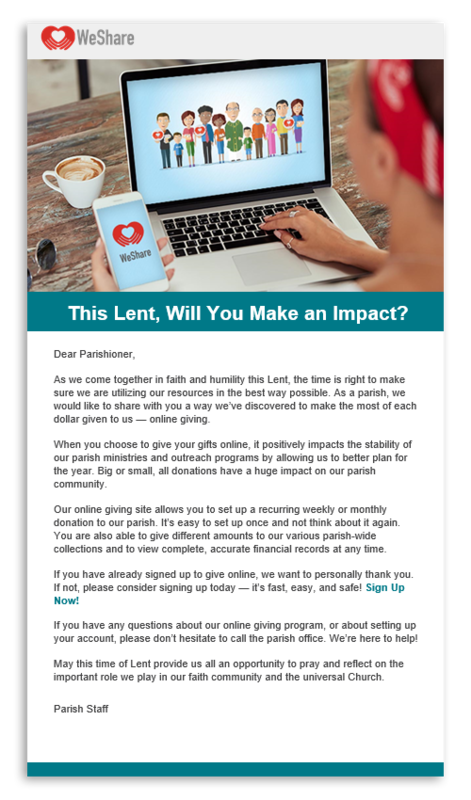 See our selected examples below, from this year's Lenten campaign. LPi is committed to keeping your parishioner contact information confidential. We do not sell, rent, or lease parish lists to third parties, and we will not provide their personal information to anyone, or use it in any other campaign, without your expressed permission. Put some intro text here for a longer description. Put some intro text here for a longer description. Put some intro text here for a longer description. Put some intro text here for a longer description. Put some intro text here for a longer description. If you have any questions, email us at WeShare@4lpi.com or call us at (800) 950-9952 during our business hours (M-F 7:00 a.m. – 7:00 p.m. CT). Thank you! Your engagement manager will reach out to you within the next 24 hours.